What a view! 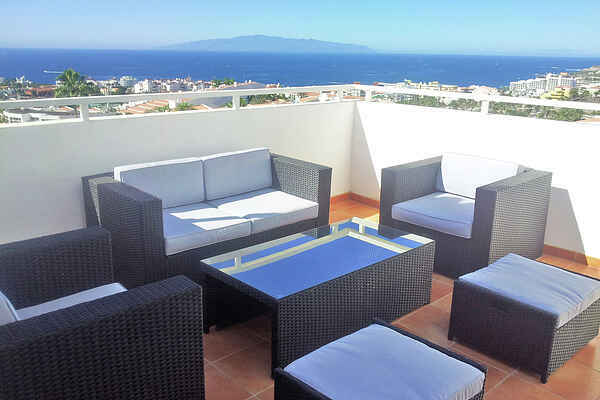 From the terraces you have a stunning view overCosta Adeje (Playa de las Americas), on the Atlantic Ocean and the island of La Gomera. Sometimes, you can see the island of La Palma and the island of Hierro. When sitting on one of the three terraces (one covered terrace, a cocktail terrace and a solarium) on a sunbed or around the table, you can enjoy this wonderful panorama. The apartment is very comfortable and has all modern comfort. The apartment is built on a hill and offers peace and tranquility. The residence has a commun swimming pool and you are just 1,5 km away from the beach and at a walking distance from shops, restaurants, bars, nightclubs... The famous Playa de las Americas is a few minutes walk and Los Cristianos at only a few kilometers. The beaches are close and the island has a lot to offer: theme parks, water parks, villages (Masca and Los Gigantes) and the famous Pico del Teide volcano and its cable cabin climbing up to the top of the volcano. Located in the National Park, El Teide is accessible via various pathways with panoramic views of the surrounding islands. Along the way, make a stop in Vilaflor, the highest village of Tenerife (1400 m) known for its local handicrafts. The apartment features a fiber-optic connection (speed about 300 Mbps).